Miss Manners is completely baffled. Emily Post has no clue whatsoever. In fact, there’s a crisis these days in the world of etiquette because none of the experts can answer the question: what drinks should be served with hot and spicy foods? The turmoil has been caused by the fact that more and more Americans are consuming hot and spicy dishes from a number of world cuisines, yet most cookbook authors and magazine writers on the subject have avoided matching beverages to the sizzling entrees. Should peppery cocktails, such as those made with chile pepper vodkas, be served with spicy foods, or is such a practice culinary overkill? Which wines should be matched with the enormous variety of exotic, incendiary dishes? What role does beer play in this question? And isn’t it only polite to provide cool-down drinks for guests whose palates have not yet adapted to the heat levels of the fiery food being served? I am pleased to announce that I have answered these questions and resolved once and for all the problem of fiery foods beverage etiquette. The task was not an easy one. It required long hours of research, testing, and the repeated tasting of alcoholic and nonalcoholic beverages in combination with chile peppered victuals, but somehow I succeeded. The key was the realization that in a typically lavish fiery feast, the beverages are served in a very consistent pattern: before, during, and after the main courses. Therefore, firewater–the generic name for these drinks–should correspond to this pattern. Since cocktails always precede the meal, it makes perfect sense that a burning beverage is the best way to prepare guests for the fiery feast to follow. The most basic peppery cocktail is one which has the heat already in it–namely, a liquor which has been treated with some variety of chile pepper. 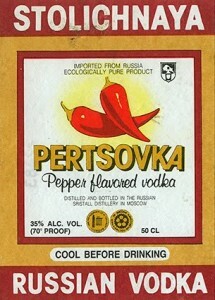 It is ironic that chile pepper-flavored liquors originated in a country virtually devoid of fiery foods: Russia. The word vodka is the Russian diminutive for “water,” which gives a fairly good indication of just how basic and important this liquor is in Russia. In fact, the people there love it so much they cannot leave it alone. They blend about forty different flavors of various herbs and spices with their vodkas, including combinations of heather, mint, nutmeg, cloves, cinnamon–and, of course, cayenne powder. Since cocktails always precede the meal, it makes perfect sense that a burning beverage is the best way to prepare guests for the fiery feast to follow. The most basic peppery cocktail is one which has the heat already in it–namely, a liquor which has been treated with some variety of chile pepper. A favorite brand of Russian chile pepper vodka is Stolichnaya Pertsovka , the famous “Stoly” which has been infused with white and black pepper combined with cayenne powder and then filtered to remove all solids. Unfortunately, the reddish tint of the vodka is the result of added caramel coloring rather than the chiles, but it still tastes great and has a nice bite. 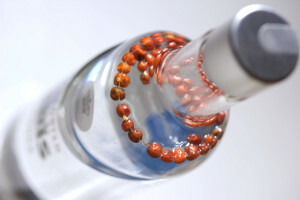 Other popular brands of hot vodkas are Absolut Peppar from Sweden and America’s own Gordon’s Pepper Flavored Vodka. Today, Bloody Marys are often made with the chile-infused vodkas, and variations on the Bloody Mary include replacing the vodka with tequila–which creates a “Bloody Maria”–or with Japanese sake for a “Bloody Mary Quite Contrary.” The cocktail can be made with one of the chile pepper vodkas to supply the pungency, or it can be spiced up with a favorite brand of bottled hot sauce. Since the various chiles used in these sauces each have their own unique flavor, the taste of the Bloody Marys can vary significantly. Tabasco Sauce, the trademarked brand of McIlhenny Company, is still the most commonly used hot sauce to spice up this drink, but these days people are experimenting with hot sauces based upon the cayenne, habanero, jalapeño, and even chipotle chiles. Today, Bloody Marys are often made with the chile-infused vodkas, and variations on the Bloody Mary include replacing the vodka with tequila–which creates a “Bloody Maria”–or with Japanese sake for a “Bloody Mary Quite Contrary.” The cocktail can be made with one of the chile pepper vodkas to supply the pungency, or it can be spiced up with a favorite brand of bottled hot sauce. Since the various chiles used in these sauces each have their own unique flavor, the taste of the Bloody Marys can vary significantly. Tabasco Sauce, the trademarked brand of McIlhenny Company, is still the most commonly used hot sauce to spice up this drink, but these days people are experimenting with hot sauces based upon the cayenne, habanero, jalapeño, and even chipotle chiles. 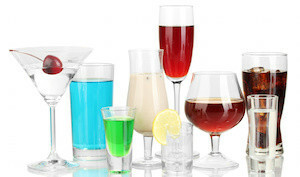 It is always embarrassing to discover–after you’ve served the peppery cocktails–that one of your guests has recently been discharged from an alcohol treatment center. So for guests on the wagon, serve them a volatile Virgin Mary, which retains the hot sauce but eliminates the vodka. Our cocktails include three highly spiced creations, and other, “normal” cocktails that go well with hot and spicy foods. The spicy cocktails are: Tex-Mex Liquors, in which we infuse tequila or vodka with fiery chiltepins; A Purist’s Perfectly Pungent Bloody Mary, which I immodestly claim is the world’s best; and Hot Tequila, Frozen Margarita, a contradiction in terms but not in taste. 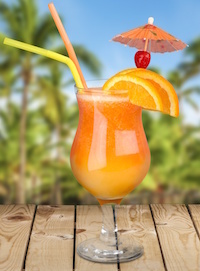 The “normal” cocktails are Tropical Rum Slush, a perfect island cooler, and Chimayo Cocktail, which combines cider and tequila. The fiery main courses have been selected, whether at home or in a restaurant. But what beverages should accompany such incendiary dishes as the ones contained in the other articles on this site? Certainly not the same peppery cocktail you’ve been drinking before the meal because the pungency of the drink will mask the complex flavors and spiciness of the entree. Since wines and beers are traditionally served with meals all over the world, the crucial questions to answer are: will the fiery foods overwhelm the wine, and do wines and beers extinguish the fire of the chiles?The fiery main courses have been selected, whether at home or in a restaurant. But what beverages should accompany such incendiary dishes as the ones contained in the other articles on this site? Certainly not the same peppery cocktail you’ve been drinking before the meal because the pungency of the drink will mask the complex flavors and spiciness of the entree. Since wines and beers are traditionally served with meals all over the world, the crucial questions to answer are: will the fiery foods overwhelm the wine, and do wines and beers extinguish the fire of the chiles? Wine expert Roy Andries de Groot believes that wines do indeed cut the heat of chile dishes. He suggests serving cold white wines with most spicy foods and claims that a Chablis, Chenin Blanc, or Colombard is “excellent for putting out chile fires.” Undoubtedly, he has heard the argument that beer and wine have some efficacy as cool-downs because capsaicin–the chemical which gives chiles their heat–dissolves readily in alcohol but does not mix with water. With beer and wine accompaniments, the heat level is not nearly as important as a harmonious blending of flavors and textures. For example, we usually drink beer with the hottest Mexican and Chinese foods because it is a perfect complement, not because of its reputation as a cool-down. With some of the spicy New Southwest meals, slightly fruity white wines such as Chenin Blancs or Rieslings seem to be a better pairing. Roy Andries de Groot has studied the problem of what wines to serve with fiery foods and advises, “My theory of the successful marriage of wine with these cuisines is to know (and separate) the gentle dishes, the spicy dishes, and the fiery dishes. The menu is then planned so that each group of dishes is paired with the wine that adds certain essential contrasts and harmonies.” For example, he recommends a Bordeaux or a Cabernet Sauvignon as the best wine to accompany the chocolate-flavored mole poblano and calls the combination “one of the more memorable marriages of exotic gastronomy.” For curries, de Groot suggests a Fume Blanc or a soft Semillon; for the entrees which top the heat scale he has surprising advice–an American light wine. Since he believes that white wine cuts the heat, he advises that the wine should be low in alcohol so it can be consumed in great quantities without discomfort.Roy Andries de Groot has studied the problem of what wines to serve with fiery foods and advises, “My theory of the successful marriage of wine with these cuisines is to know (and separate) the gentle dishes, the spicy dishes, and the fiery dishes. The menu is then planned so that each group of dishes is paired with the wine that adds certain essential contrasts and harmonies.” For example, he recommends a Bordeaux or a Cabernet Sauvignon as the best wine to accompany the chocolate-flavored mole poblano and calls the combination “one of the more memorable marriages of exotic gastronomy.” For curries, de Groot suggests a Fume Blanc or a soft Semillon; for the entrees which top the heat scale he has surprising advice–an American light wine. Since he believes that white wine cuts the heat, he advises that the wine should be low in alcohol so it can be consumed in great quantities without discomfort. When deciding which beers to offer guests who are about to assault their senses with chile heat, one logical solution is to do a regional match: Carta Blanca with Mexican foods, a Tsingtao with Sichuan dishes, Tusker with African entrees, Red Stripe with Jamaican foods, and so on. With American spicy specialties, such as New Mexican or Cajun, we suggest forgetting every American beer which is advertised on nationalTV–they are all mediocre at best. Instead, serve one of the finer regional specialty beers such as Capitol or Augsburger from Wisconsin, or Anchor Steam from San Francisco. Incidentally, some writers insist that dark beers should never be served with spicy foods because they are traditionally served in cool climates rather than tropical ones. Such a judgment makes little culinary sense because often one needs a heavy, dark beer to match a meal measuring eight or more on the heat scale. 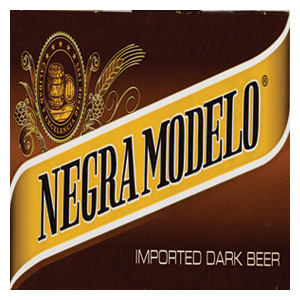 Besides, the theory is proven false in Mexico, where such fine dark beers as Negra Modelo and Dos Equis are commonly served with the hottest meals. For hosts still in a quandary about which beers and wine to offer, why not present a number of selections to your guests and have them decide–by tasting them all–which wines and beers go best with the fiery foods being served?Two to include are different sangrias (in taste as well as color), Red Wine Sangria and White Wine Sangria.For hosts still in a quandary about which beers and wine to offer, why not present a number of selections to your guests and have them decide–by tasting them all–which wines and beers go best with the fiery foods being served? Two to include are different sangrias (in taste as well as color), Red Wine Sangria and White Wine Sangria. Believe it or not, some chile addicts believe that every course of the meal should burn. After peppery cocktails, fiery appetizers, spicy soup, and three different incendiary entrees, they have the nerve to serve jalapeño sorbet for dessert. Fortunately, the vast majority of chile cooks believe that enough is enough and prefer a soothing cool-down as a perfect finish for a fiery feast. As with beers and wines, a debate rages over precisely which drinks actually tame the heat of chiles. Recommendations range from ice water to hot tea to lemon juice to one of our favorites, Scotch on the rocks. Most of these liquids can be dismissed out of hand. Ice water is totally useless because capsaicin and water don’t mix. As soon as the water leaves the mouth, the fire rages on. Hot tea is a legendary Vietnamese remedy, but there is no logical reason for it to work because it is ninety-nine percent water. Lemon juice seems to help some people, but somehow we can’t picture our guests sitting around the table sucking on lemons after a marvelous fiery feast. And as for Scotch on the rocks, well, if you drink enough of it, you soon won’t care about cooling down.As with beers and wines, a debate rages over precisely which drinks actually tame the heat of chiles. Recommendations range from ice water to hot tea to lemon juice to one of our favorites, Scotch on the rocks. Most of these liquids can be dismissed out of hand. Ice water is totally useless because capsaicin and water don’t mix. As soon as the water leaves the mouth, the fire rages on. Hot tea is a legendary Vietnamese remedy, but there is no logical reason for it to work because it is ninety-nine percent water. Lemon juice seems to help some people, but somehow we can’t picture our guests sitting around the table sucking on lemons after a marvelous fiery feast. My after dinner drinks reveal the wide range of cool downs. The first three, Strawberry Liquado, Agua Fresca de Tamarindo, and Mexican Hot Chocolate hail from south of the border, where the folks know how to make a cool- down. Our version of the famous drink, Brandy Alexander Cool-Down, has been fortified with ice cream to really cut the heat. Actually, it was East Indian cooks who perfected the solution to the problem of after-dinner cool-downs. They discovered that the most effective antidote for capsaicin is dairy products, particularly yogurt. The Indian yogurt and fruit drink called lassi is commonly served after hot curry meals, and it is sweet, refreshing, and effective. No one seems to know precisely why milk, sour cream, yogurt, and ice cream cut the heat, but they do. Experts say that the protein casein in the dairy products strips the the capsaicin molecules off the capsaicin receptors in our mount and tongue, but all I know is that the heavier and thicker the dairy product, the better it cools down the mouth. Included here is Mango Lassi, with one of our favorite fruits, and Lassi, Come Home–You’re Frozen, with another one in a more solid form.Actually, it was East Indian cooks who perfected the solution to the problem of after-dinner cool-downs. They discovered that the most effective antidote for capsaicin is dairy products, particularly yogurt. The Indian yogurt and fruit drink called lassi is commonly served after hot curry meals, and it is sweet, refreshing, and effective. No one seems to know precisely why milk, sour cream, yogurt, and ice cream cut the heat, but they do. Experts say that the protein casein in the dairy products strips the the capsaicin molecules off the capsaicin receptors in our mount and tongue, but all I know is that the heavier and thicker the dairy product, the better it cools down the mouth. Included here is Mango Lassi, with one of our favorite fruits, and Lassi, Come Home–You’re Frozen, with another one in a more solid form. So there you have it, the solution to the etiquette problem of the century: what drinks to serve with fiery foods. To review the answers briefly, first prepare the guests for the fiery food to follow with peppery cocktails; next, match the proper wines and beers to the spicy entrees; and finally, cool down with the suggested drinks for dessert. I’m certain Miss Manners will approve. So there you have it, the solution to the etiquette problem of the century: what drinks to serve with fiery foods. To review the answers briefly, first prepare the guests for the fiery food to follow with peppery cocktails; next, match the proper wines and beers to the spicy entrees; and finally, cool down with the suggested drinks for dessert. I’m certain Miss Manners will approve. 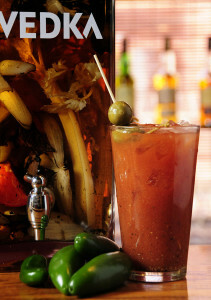 Here it is, the ultimate Bloody Mary designed for the ultimate peppery cocktail snob. Canned tomato juice is permitted only when fresh, vine-ripened tomatoes are not available. Combine all ingredients and shake with ice cubes. Serve garnished with a slice of fresh serrano or jalapeño chile. Prepare 4 long-stemmed goblets by rubbing the rims with a piece of lime section. Dip the goblet rims in the salt and then place the goblets in the freezer for at least 30 minutes. 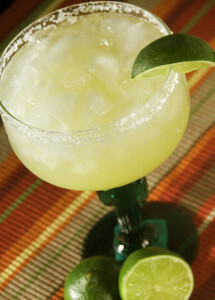 Juice the limes and then place the lime juice, tequila, and triple sec in a blender. Add the crushed ice until the blender is half-full and then process. Taste the results and adjust the flavors by adding more triple sec to make it sweeter, more lime juice to make it more tart, tequila to increase the heat level, or ice to decrease the heat level. Pour into the frosted goblets and garnish with a slice of lime. Rum is the favorite drink of the Caribbean, where Mary Jane and I travel all the time. We prefer dark rum, but any variety will work in this cooler, which is enough for a party. Put all of the ingredients in a one gallon plastic container, shake, and fill with water up to 1 1/2 inches of the top. Cover tightly, shake the container vigorously, and freeze overnight. Scoop the mixture into chilled old-fashioned glasses and add a straw. This cocktail comes from the famous restaurant, Rancho de Chimayo, in Chimayo, New Mexico. The area is known for its fine apple orchards, so when you recreate this drink, make sure you use premium organic apple cider. We can taste this cocktail right now–sitting under one of the trees on the restaurant’s patio, admiring the view. Fill an old-fashioned glass 3/4 full with ice cubes. Pour the ice cubes and the drink ingredients into a cocktail shaker and shake vigorously. Pour the contents back into the old-fashioned glass. Garnish with an apple slice if desired. The cocktail can also be served chilled without the ice, but it can be fairly potent that way! 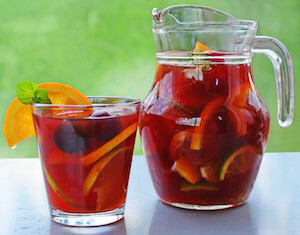 This red Sangria makes a refreshing and easy drink to serve at summertime festivities. Since it is prepared in advance, the host only needs to pour. Served in a clear, glass pitcher, it is attractive enough to grace the dining table. Pour the wine into a large glass pitcher or punchbowl and add the remaining ingredients, except the club soda, and stir until the sugar is dissolved. Allow the mixture to stand 1 hour before serving, and then stir again before serving. Serve in tall glasses filled with ice cubes, adding 3/4 Sangria to 1/4 chilled club soda. The traditional Spanish Sangrias are very fruity, but not too sweet. We suggest you try one of these two recipes, serving it chilled in a large glass pitcher. Pre-mixed, bottled Sangrias tend to be overly sweet and lack the fresh fruit sparkle. Combine all the ingredients, except the club soda, and allow to marinate for several hours or overnight in the refrigerator. Serve in tall glasses filled with ice cubes, adding 3/4 Sangria to 1/4 club soda. This refreshing dessert drink originated in India, where it is often served after a meal of fiery hot curries. 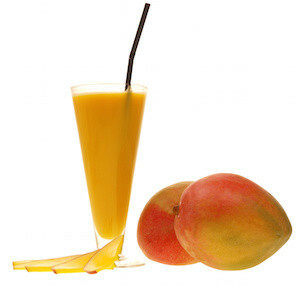 Fruits such as pineapple, strawberries, peaches, or pineapples may be added to or substituted for the mango. Place all ingredients in a blender and process until smooth. Serve over ice, or freeze until slushy and then serve. This additional, refreshing Indian concoction can be served as a drink or as a dessert–just freeze the mixture a little longer. Almost any combination of fruit will work well. Place all of the ingredients in a blender and blend until smooth. Pour into a container and freeze for about 30 minutes until slushy. Break up the mixture lightly with a spoon and pour it into a chilled glass, or freeze it longer and serve in chilled dessert dishes. This refreshing, non-alcoholic drink is very popular in Mexico, where it is made from all kinds of exotic fruits. In the citrus liquados , the fruit is halved, juiced, and the rind is put in the blender along with the other ingredients–water, ice, and a bit of sugar. Place all the ingredients in a blender and blend thoroughly. Serve in a tall, chilled glass. I thank my friend Robb Walsh for this recipe. Robb says, “Agua Fresca is thirst-quenching, has more nutritive value than tea or water, and you can drink lots of it without worrying about caffeine or alcohol.” His kids drink it by the gallon to cool off during the hot Austin summers. Rinse the beans and drain them. Put them in a soup pot and add enough water to cover them. Cook at a low boil for 10 minutes. Mash the softened beans vigorously with a potato masher. Strain the coffee-colored liquid into a gallon container, throwing away the seeds and outer pods as you go. Add the sugar or honey while the liquid is still hot. Add water to fill the gallon container. Refrigerate and serve over more or less ice to make it as strong or weak as you like it. If you have never tried this Mexican-style hot chocolate, indulge yourself. It is quite rich and loaded with milk and cream, so save it for a sweet, splurge occasion. In Mexico the chocolate is beaten with a molinillo , a wooden utensil that is quickly twirled between the palms of the hands to mix and create a froth on the chocolate. Combine the first 8 ingredients in a heavy saucepan over a low heat, whisking occasionally. Add the 6 cups of milk and scald the mixture, whisking continuously and making sure the mixture does not boil. Add the vanilla and the cream, continuing to heat and whisk until a froth appears and the milk is heated through. Serve in warm cups, garnishing with a whole cinnamon stick, if desired. Place all ingredients in a blender and process. Serve in dessert glasses.